As an ESL teacher, I have fallen in love with I have/who has games! They are a great way to have the students engaged while practicing their reading, speaking, and listening skills. This particular I have/who has game is dedicated to Onomatopoeia. 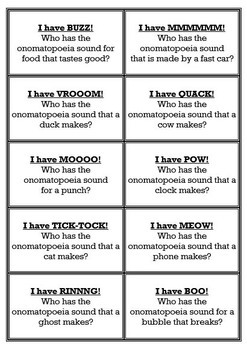 The students are given a description of a sound, such as, "Who has the Onomatopoeia sound that you make when you are cold?" Another student will then respond, "I have BRRRR!" The students will enjoy making the silly sounds, while becoming familiar with the concept and meaning of (such a funny sounding word itself!) Onomatopoeia! I have/who has games are great for a learning center, partner/group work, or even a whole class review! *45 cards included! Print, cut, teach! Onomatopoeia I Have / Who Has by Cappy's Creations is licensed under a Creative Commons Attribution-NonCommercial-NoDerivs 3.0 Unported License.